Electronic products containing a circuit board or cathode ray tube (CRT) such as a T.V. or computer monitor cannot be placed in the garbage because they contain hazardous materials such as lead, cadmium and mercury. These hazardous materials are harmful to human health and the environment. Find out how to dispose of electronics properly using the list below. Some manufacturers and retailers will take back your old electronics for recycling. Some such as Hewlett Packard even offer cash back. Drop off electronics for a nominal fee at Citywide Drop-off Events. Drop-offs are scheduled June through October each year. If it still works, give it away on the Twin Cities Free Market. 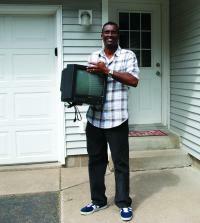 For a fee, you can drop off your old electronics for recycling. Check with each company for their rates and services. Starting October 2018, Saint Paul's new citywide garbage services will allow residential homeowners to have 2-3 large, "bulky" or electronic waste items collected (depending on your service level), free of charge, each year. Please don't put these items in your garbage cart. If you have more large items, no worries. Your hauler will take those away for a nominal fee. Here's a list of accepted large, bulky and electronic items. Como Zoo is a permanent collection location for unwanted cell phones. All cell phones collected are sent to Eco-Cell for recycling and Como Zoo will receive funds for each phone donated. The funds raised will go to conservation projects that help preserve one of the most critically endangered species on earth, the Orangutan. Drop off your unwanted cell phone in the collection boxes located in the Visitor Center and Primate Building. For more recycling opportunities, visit Rethink Recycling's electronics recycling webpage or call the Ramsey County Hotline at 651-633-3279 (EASY). Visit Ramsey County's A to Z Guide or call the Ramsey County Hotline at 651-633-3279 (EASY) for more information.